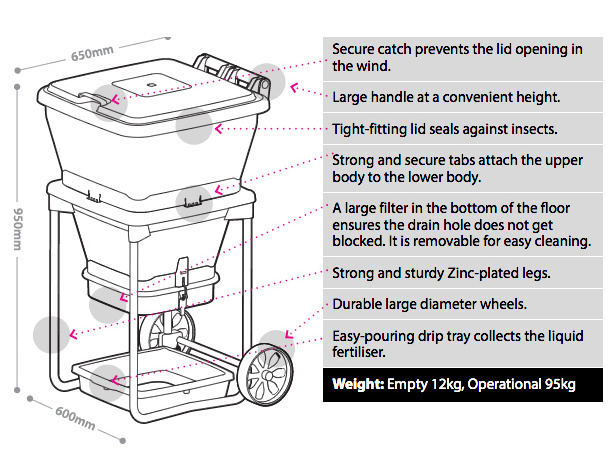 The Hungry Bin is an efficient worm farm, but it comes with a hefty price tag. It’s big and also requires some patience when starting out. You may need to wait 3-4 months before you can harvest the worm castings. However, this largely depends on the amount of food supply there is and the general health and population of your worm colony. 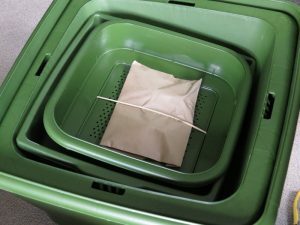 This Hungry Bin review considers several aspects of a worm farm. The Hungry Bin has a continuous flow-through system design. This is far more efficient than stacked tray systems. Compost worms are surface eaters. As they digest the food scraps placed into the top of the bin, they produce worm castings (or worm poop). The worm castings continuously flow downward, gradually compacting neatly at the bottom ready for removal. Worm castings continuously flow downward, gradually compacting neatly at the bottom ready for removal. To harvest the Hungry Bin, release the latches to remove the floor underneath. The Hungry Bin needs to be at least ¾ full at all times to work most efficiently. You should only harvest worm castings when the bin has become full to the top. You can expect to harvest the worm castings every 2-6 months. To harvest, release the latches to remove the floor underneath. The tapered shape of the bin means only the castings in the bottom part of the bin will fall out. Each harvest will produce about 4 kg of compost. This means no no heavy lifting unlike many stacked tray worm farm systems. Since worms migrate upwards to the surface to feed, the castings will be worm free. Note a common trap is harvesting the worm castings too early. 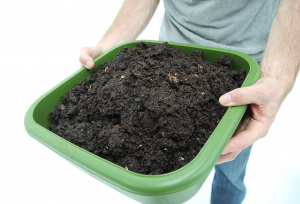 If the worm castings are not compacted enough, the contents in the bin can fall out. You can guess where the name Hungry Bin comes from. Broken kerbside rubbish bins were used in the early designs of the Hungry Bin. But don’t be deceived, the Hungry Bin is not the same as a rubbish bin. Although influenced by a rubbish bin, the design has adapted for efficient vermicomposting. The Hungry Bin is neatly packaged in a cardboard box. Detailed assembly instructions with pictures can be found on the Hungry Bin website. Compost worms are surface feeders. The top of the bin has a large surface area which helps to speed the composting process. However, air ventilation in the Hungry Bin is not a strong point. 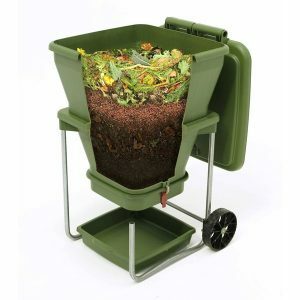 The design of the bin uses gravity to compact the worm castings as it flows through the bin. The large mass of compact worm castings can restrict airflow. Liquid passes through a filter and drips into an open drip tray on the ground. Compacted worm castings can restrict drainage and encourage anaerobe activity. Sometimes is is necessary to lightly lift and fluff the bedding material to help fix problems in the bin. This is not as easy to do with the Hungry Bin compared to stacked tray bin systems, as it’s one large container. The Hungry Bin has a large processing capacity. When the bin is full of worm castings, it can weigh up to 95 kg. So it cannot be easily hidden out of sight. Given it’s size, the Hungry Bin is not suitable for indoors. In addition, the large mass of compost helps regulate the temperature in the bin. As it takes longer to heat up and longer to cool down. A diagram of the Hungry Bin dimensions and key features. A lot of worm bins are difficult to maneuver. This is not a problem with the Hungry Bin as it comes on wheels. I find a lot of commercial worm bins are not big enough to support a small family. The average worm bin can hold up to 4,000 worms. The Hungry Bin at full capacity can support a population of 12,000 worms. The average food waste from a family of 4 would need about 20,000 worms to process each day. Given not all food waste is suitable to feed to worms, the Hungry Bin might be the answer. We can’t forget mentioning the price in our Hungry Bin review. Because it’s not cheap! But hey, they say you get what you pay for. And the Hungry Bin is no exception. It’s definitely a quality product. All in all, the Hungry Bin is a superior worm farm compared to it’s rivals. The patent pending tapered continuous flow design is innovative and highly efficient. However, beginners should start with a smaller bin. It’s easier to learn the ropes and fix mistakes in a smaller bin. Once you have learned the basics, you should consider upgrading to the Hungry Bin. I agree the cost is quite expensive for your average vermicomposting hobbyist. I’d say they are targeting a different market though including businesses, schools and local governments or councils.